The families of five young IDF soldiers from Jerusalem who were killed this summer in the Gaza war, joined by more than 1,000 Israelis and visitors, gathered near the Jaffa Gate to the Old City on Tuesday night—for a very moving ceremony on the first night of Chanukah. 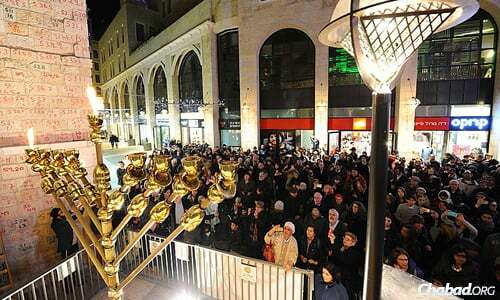 A huge Chanukah menorah was constructed in the Mamila Mall under the direction of Rabbi Eliyahu Canterman, co-director of the Chabad Center of Talbiyeh in Jerusalem. 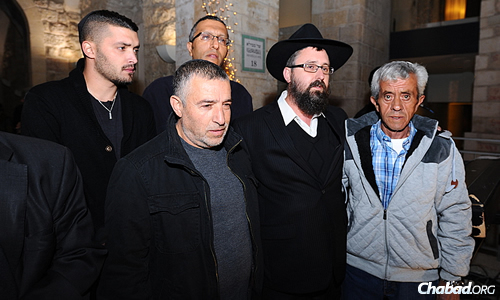 He invited the Chabad Terror Victims Project (CTVP) to take part in the menorah-lighting, asking to bring the families of the five IsraelDefense Forces soldiers from Jerusalem—Sgt. Dor Derei, Staff Sgt. Liel Gidoni, Staff Sgt. Moshe Malko, Capt. Dimitri Levitas and Lieut. Natan Cohen—who were killed during this summer’s war with Hamas in Gaza to be the guests of honor. 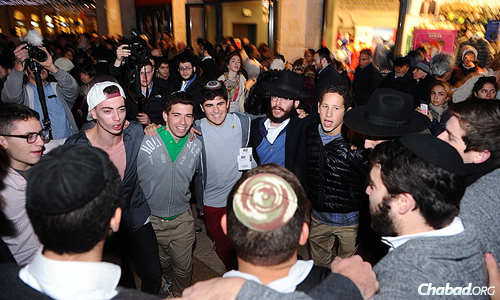 All five families came, bringing 25 people in total to the event, with its theme “Light Will Win.” More than 1,000 Israelis and visitors crowded the mall to observe the ceremony. 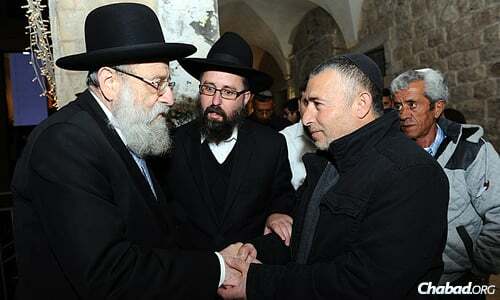 Canterman gave a moving d’varTorah, and Rabbi Aryeh Stern, the Ashkenazi chief Rabbi of Jerusalem, offered words of comfort, encouragement and blessing. 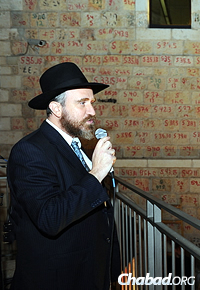 There were tears in the eyes of everyone present as Rabbi Yossi Swerdlov, associate director of CTVP, read the names of the five soldiers aloud and spoke to the crowd that had assembled.Canterman gave a moving d’varTorah, and Rabbi Aryeh Stern, the Ashkenazi chief Rabbi of Jerusalem, offered words of comfort, encouragement and blessing. 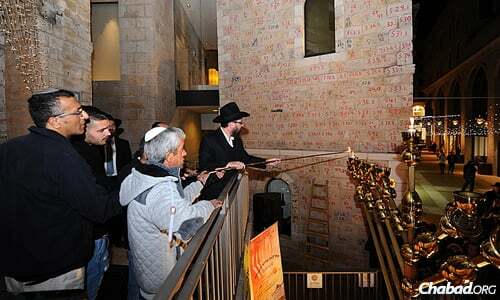 Emphasizing the evening’s theme, CTVP director Rabbi Menachem Kutner, together with the bereaved families, lit the giantmenorah. 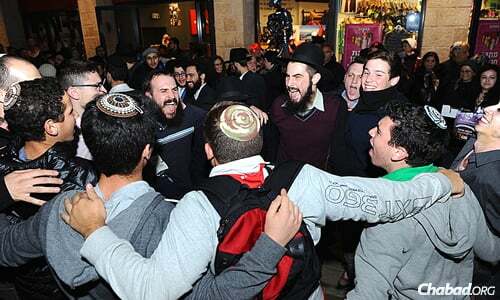 The words of inspiration were followed by festive dancing led by brothers Jonathan andAaron Razel, who played Chanukah songs and brought families into circles to dance. The evening ended with Canterman and his wife, Chana, thanking CTVP for bringing the families, and thanking the families for the honor of being able to host them. CTVP took the families and others out afterwards for a festive meal at Café Rimon on the mall. A total of 72 families lost a loved one in the summer war, and the lighting was in all of their memories. CTVP has made it a point over the eight-day holiday to visit each city where families suffered a loss. Staff will also spend time with many of the more than 3,000 families they are assisting who have been affected in past wars and terror attacks, bringing them comfort and strength, and lighting Chanukah candles with them.